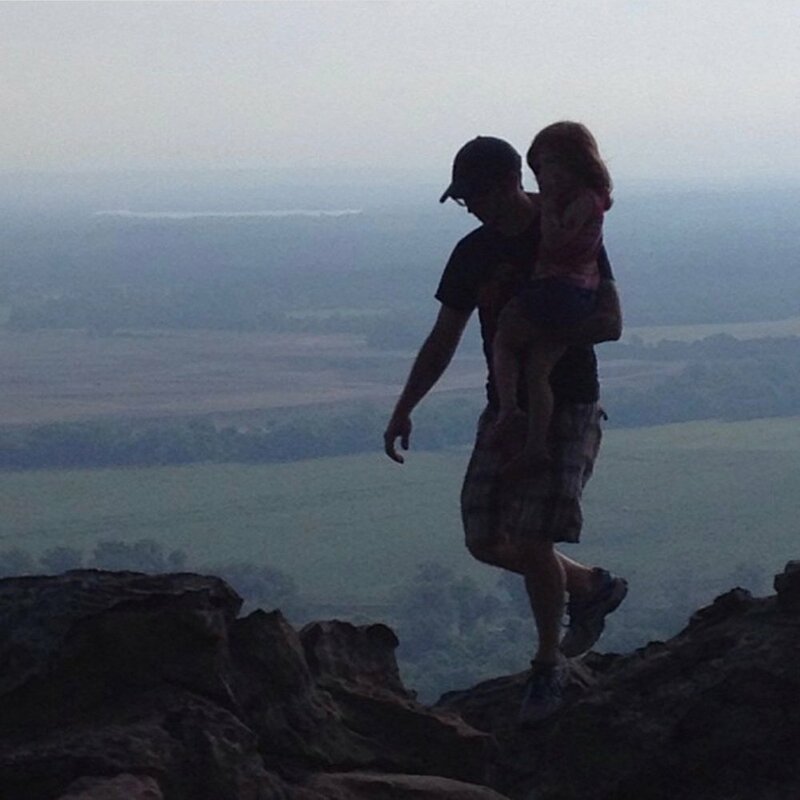 Me and my daughter the first time we climbed Petit Jean Mountain in 2013. For most of us homecoming is a word that instantly brings back clear and tangible memories. It probably brings to mind memories of bad food, cheesy limo rides, sneaking champagne and whiskey out behind the gym, or making out with your date on the ride home. You see most of us grew up in one place. You might even still live in that place and maybe you even drive by that gym every so often. For me the idea of homecoming is a bit more complicated. While I did spend the majority of my years in one place, my earliest years were spent in several places: first New York, then Connecticut. We lived in several places in each state before building a house in Connecticut on 4 acres of timber land. We lived there just long enough to have one birthday and one Christmas and then we moved down to Georgia where I stayed till graduating college – about 15 years later. Then I moved to Florida. Then I moved to Virginia/D.C.. Then I moved back to Florida. Then I moved to Arkansas. And here we are to stay. Homecoming, in the classical sense, means a return. It means you’ve been somewhere, laid down roots, left for some other adventure and have now come back. While I could definitely say spending 15 years in Georgia, from elementary school through college, certainly had an effect and planted some roots, it never felt like home. When I went back it never felt comfortable or familiar or like family. It felt like that place that I lived for a while. Most of the places that I’ve lived feel like that even now. New York and Connecticut, for example. My entire family still lives there. They’ve all grown up there. It is their home. It has never really been my home. But 5 years ago my family and I moved to a place we had never been to before. A place we had no connection to other than it’s proximity to Kansas City where my wife’s family lives. A place that we fell in love with even before accepting a job here. It’s now the place we call home. It is a place that, when we are away, we want to return to; a place that, when we return, feels like home, feels comfortable, familiar and like family. Unlike most people my homecoming was to a place I had never been before. But now that I am here I don’t have any desire to leave. Little Rock is home. And looking back on my time here I can see the influences that have shaped my life and my work for the better.